Inventory and Economics. Experiencing the Lesson First Hand. It's about Rhode Island Real Estate, Living, Lifestyles, Local Happenings... and so much more. If the Real Estate catchphrase of 2012 was “interest rates” 2013 will be “inventory”. 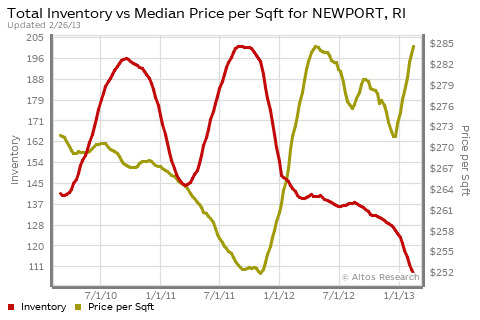 So far it’s been a fantastic and frustrating 2013 for us realtors here in Newport, and per the media, we’re not alone. Inventories nationally are at 13 year lows. As I mentioned in a blog post back in November, inventory levels were continuing to decrease, pointing towards a renewed seller’s market. Looking at charts here in Newport County the trend doesn’t seem to be changing. These charts make me think back to my Economics Classes at Saint Anselm College with Professor Romps, specifically about supply, demand and the “invisible hand”. Prof. Romps was a 6’3” 280lb angry 65 year old man. It was impossible to fall asleep in his class even at 9am on Friday. In the end, he turned out to be one of my favorite teachers because of how entertaining and, ahem, “motivating” his lectures were. 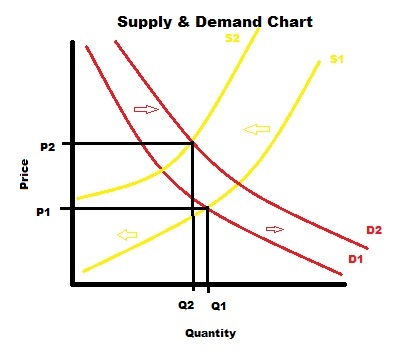 We were taught when supplies decrease, demand stays constant, prices increase. With this in mind, Real Estate is considered to be “inelastic”, meaning the invisible hand is slower to move pricing than say that of gasoline. Prices slow to respond to the low inventories, but overtime the change we’re all expecting will come to fruition. With the lack of inventory and increase in demand, sellers will be allowed to be more liberal with their pricing. Over the next year or so, as long as demand stays consistent, we’ll continue to see prices climb. Hopefully we can see inventories start to pick up. I have plenty of buyers that keep telling me “Jeff, we don’t see anything on the market, so we’ll wait until more inventory comes on.” So, to sellers out there reading this: Please list your house so I can sell it! Filed Under: How's the Market? RI HOUSE HUNTING CHECK LIST: How do YOU like to live? No Boat Taxes in Rhode Island? Yes, it’s true.